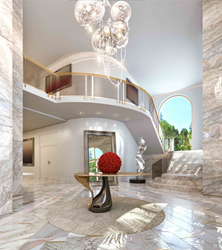 The Estates at Acqualina reveals renderings of its single-family home for the ultra-luxury residential development in Sunny Isles Beach, on the grounds of the Forbes Five Star and AAA Five Diamond Acqualina Resort. "This oceanfront oasis comes with a $2.5 million poolside cabana designed by Fendi," said Michael Goldstein, president of sales. The Estates at Acqualina, the new highly anticipated $1.5 billion residential development in Sunny Isles Beach, will feature 245 exquisite residences and deliver an unparalleled living experience within a private gated community. The crème de la crème includes two double-story penthouses and two single-family homes. One of these homes is Casa D’Oro, located on the ground floor of one of The Estates’ shining towers, Via Acqualina 777. Residents will have all the benefits of condo living with the feeling of a private home boasting easy access to the Atlantic Ocean right outside. The six-bedroom, seven-and-a-half-bathroom home is comprised of 11,605 total square feet of indoor and outdoor space over two levels. Marble and wood floors add an elegant touch and pair perfectly with the onyx walls located in the master baths. Leather and suede finishes are part of the oversized his-and-her dressing rooms. The master suite boasts a midnight bar with a Miele coffee system and refrigerator, a sitting area and an outdoor terrace that overlooks the water. The 2,375-square-foot garden terrace features a summer kitchen, a sauna, and a private swimming pool—a rarity for residential buildings. The property also features a $2.5 million poolside cabana designed by Fendi with a two-car garage. A separate air-conditioned garage has space for four additional cars, and it comes with a private elevator that offers access to the home for added convenience. Residents will have access to private amenities such as a spa, fitness center, ice skating rink, golf simulator, bowling alley, Formula One simulator and a Wall Street Trader’s Club. Fashion icon Karl Lagerfeld will be designing the lobbies in the two residential towers, marking the designer’s first ever interior design project in the United States. One thousand feet of pristine Atlantic Ocean beachfront awaits outside Casa D’Oro’s doors as well as an extensive range of outdoor amenities available exclusively to residents of The Estates at Acqualina along with the five star amenities of the adjacent Acqualina Resort & Spa. Following on the heels of the successful sellout of The Mansions at Acqualina, The Estates at Acqualina will become the world’s finest residences. When complete, The Estates at Acqualina will offer 245 luxurious residences from three to seven bedrooms in two, 50-story boutique towers, 777 Via Acqualina and 888 Via Acqualina. Each estate in the sky will be delivered furniture ready, and equipped with the finest appliances, imported stone countertops, smart-home technology and 10-foot 6-inch ceilings. Each master suite will boast his and her bathroom suites with imported onyx countertops and walls and marble floors, a steam mist shower, a free-standing tub, an ocean-view shower and elaborate his and her dressing rooms. The Estates’ 5.6 acres of grounds and gardens will boast lush landscaped gardens, multiple infinity pools, a FlowRider® for surfers, a basketball court, a bocce court, a dog park, soccer field, a beachfront restaurant and 502 feet of Atlantic oceanfront with Five Star beach and pool services. Also available will be 24-hour valet, 24-hour security services, a full service resident concierge and a house Rolls-Royce.